Excuse me, I have your new favorite wrap recipe right here. Yup, this will be your new go-to wrap. It’s fresh and light, quick and easy, and oh so pretty! Basically, it’s the ultimate chicken wrap, full of flavor and made on the lighter side… and even made without cheese. WHOOAAAAA. I didn’t know I would be one to like a wrap minus cheese, but I do. I will be the first one to admit I didn’t miss the cheese at all. 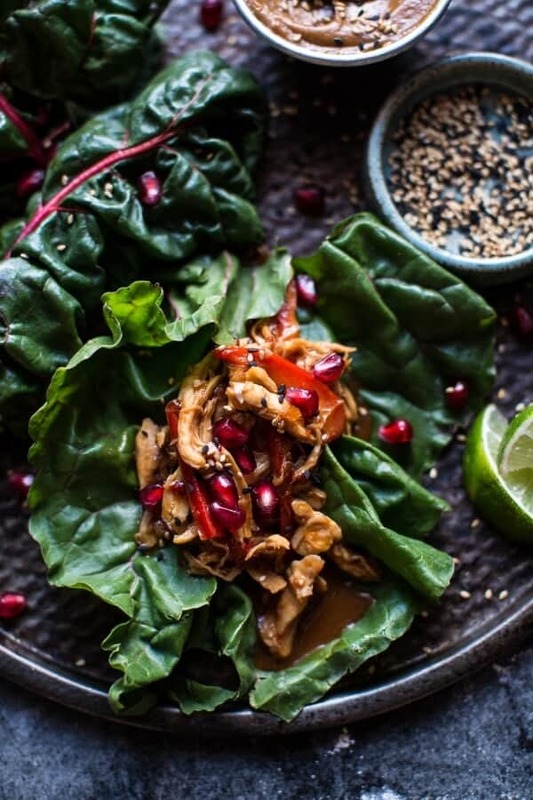 Until then we’re talkin’ Sweet Thai Chile Chicken Swiss Chard Wraps!! Promise, they’re so good. First though? Random question time. Do you guys ever mess up so bad in the kitchen that it’s almost scary? I do, all the time, and with all the recipes I’ve been making between freelance work, the blog and the cookbook it feels like fifty percent of my attempts are complete fails. I haven’t talked much about the cookbook on the blog, but today I have some words. My cookbook recipe testing/photographing have been kicked into overdrive this month as I have realized that I have way too much to do and not enough time. Story of my life, right? Therefore, I am cooking, cooking, cooking, photographing, possibly shedding tears or cheers – depending on how the day is going, photographing some more and then writing into the wee hours. I’d like to say I am exaggerating, but I’m not. It’s all A-OK though, I love what I do and the more I do it, the better I become. Or at least I hope that’s how it is working. Fingers crossed. I’ve decided to start document all the kitchen fails and plan to share them with you guys, maybe before or after the book comes out. They should be pretty funny… I think. I also have grand plans to show you guys some sneak peaks into the process of creating a cookbook. So far though, I have zero photographs to back up all my thoughts on cookbook writing. I promise that post will be coming within the next month or so and then I hope to continue them throughout the rest of cookbook making process. Does that totally bore you or make you excited to see some behind the scenes? I am nosey little person (I think because my life is so beyond boring), so personally, I love behind the scenes stuff. Whatever, like it or not, it’s totally coming your way. Or at least I hope it is! Again, fingers crossed. But telling you all about it now sort of holds me accountable, so the odds are looking good. The weird thing is, even with all the food I’ve been making, I have still have needed to come up with easy dinner recipes. You’d think I would have food out the Yazoo, and most of the time I do, but then there are those odd days that happen every so often when my fridge is actually cleared of leftovers. This means, one – the obvious, they all the got eaten, two – they were too gross to consume and were thrown out, three – my parents had a surplus of visitors one week and there was never enough food, or four – my brother’s girlfriend Lyndsie came over opened my fridge, felt stressed about the clutter and just threw out the super old food that had surely seen better days. Week old tuna, I am talking to you. So when that happens, and food is needed, I’ve gotten into the habit of making this Thai chicken. It’s sweet and spicy and so easy to assemble. 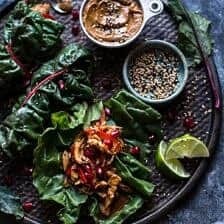 You can serve it in these pretty collard wraps, like I have shown here with maybe a side of steamed rice or quinoa, OR you can simply serve over rice and make one yummy as heck rice bowl. 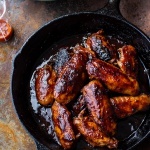 You could even get super creative and make things like tacos, enchiladas, quesadillas, salads – really all sorts of things can be made with this chicken. It’s a solid recipe. Meaning it’s delicious, easy and healthy. One thing though, you cannot skip the ginger peanut sauce – this is everything. <–truth. Also, these wraps are great for packing for lunch. I obviously love when the chicken is warm, but even cold it’s still delicious. So basically what I am saying is that you should make these tonight for dinner, eat them warm and then pack them up and take them to work or school or wherever you will be tomorrow for lunch. Double duty meal! Combine the sweet thai chili sauce, soy sauce, peanut butter, pomegranate juice, rice vinegar, lime juice, fish sauce (if using), garlic and ginger in a medium sauce pot. Bring the sauce to a boil, reduce heat and simmer 5-10 minutes or until sauce has thickened slightly. Remove from the stove. Add the chicken and bell pepper to a bowl and toss with the thai chile sauce. Remove the thick stems from the Swiss char leaves. Spread a tablespoon or so of the peanut ginger sauce (recipe below) down the center of the leaf. Place a spoonful of the chicken mixture in the middle of the leaf. 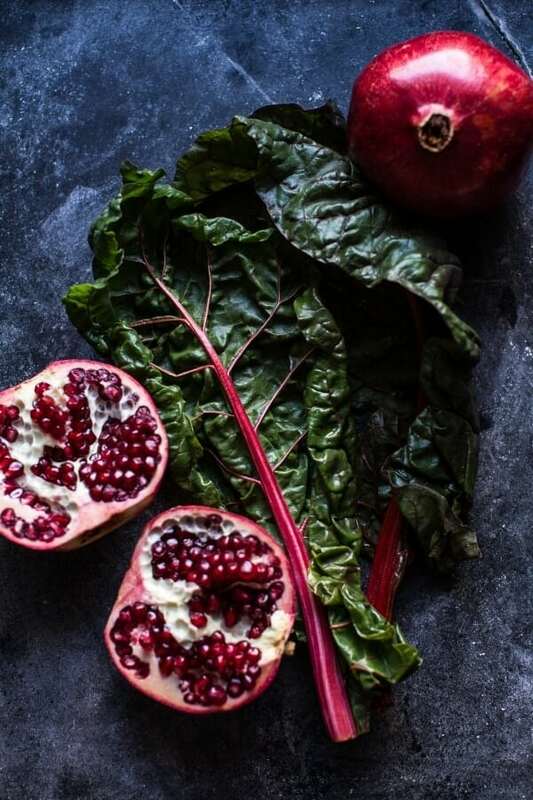 Add a handful of pomegranate arils and sprinkle of cilantro + sesame seeds. Roll up to enclose the filling. Serve the wraps with the peanut ginger sauce for dipping. In a bowl, combine the peanut butter, soy sauce, ginger and rice vinegar. Add 2-4 tablespoons of water to thin the sauce out. Keep any leftovers covered in the fridge for up to 2 weeks. *You can use a rotisserie chicken, leftover grilled chicken or grill/bake fresh chicken breasts for this recipe. **Peanut Ginger Sauce adapted from Donna Hay Fresh and Light. Seriously… the peanut sauce? It’s heaven. 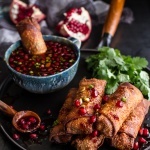 Chinese Chicken and Brussels Sprouts Egg Rolls with Sweet Chile Pomegranate Sauce. 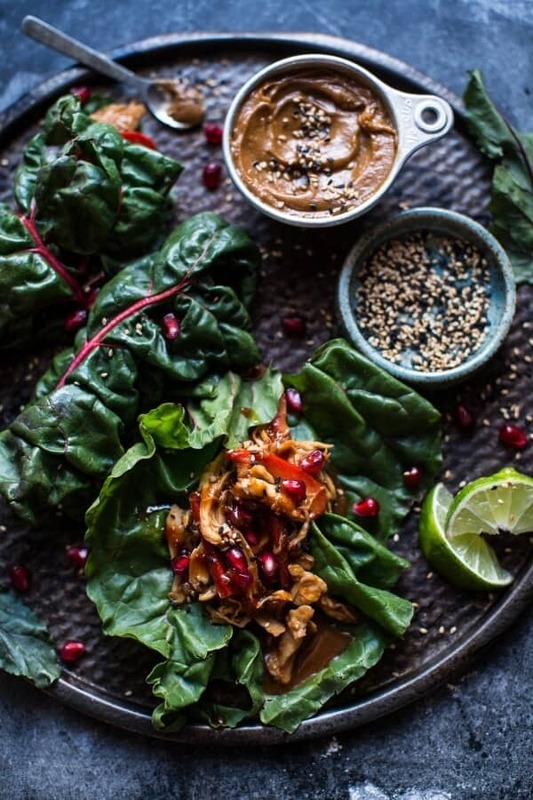 that peanut sauce sounds amazing- and i would have never thought to add pomegranate juice! seems like the perfect way to balance such a creamy sauce. and i love the idea of a behind the scenes about your cookbook- i’m super nosy too, haha. 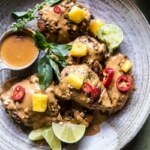 This peanut sauce looks amazing – I have been looking for a peanut sauce recipe for a while. I’m not a big lover of swiss chard, could I use cabbage or lettuce instead? Cabbage or lettuce will be great! I don’t know how you do it all Tieghan, You’re aome kind of super woman with all the amazingness you crank out 24/7. This looks so great and I love that it is super easy and a great on-the-go meal. Try to find a few seconds to chill out, Girl. You deserve them. It’s actually very reassuring to know you have a few fails along the way Tieghan, though it’s hard to imagine, as what you share always looks so darn amazing! 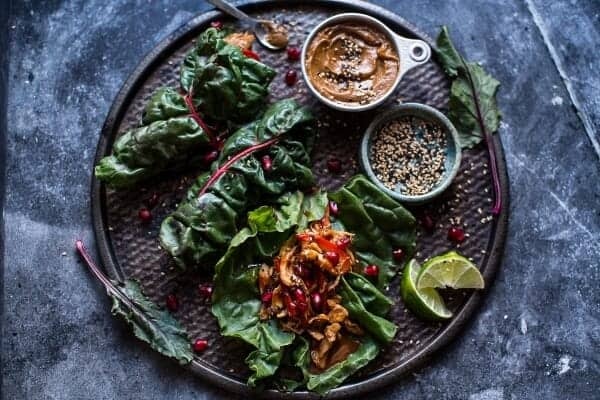 Love the wraps, and can’t wait to see the cookbook! Look at you just go go go! You’re amazing! Don’t forget to find some “you time” 🙂 These wraps just looks heaven sent, I mean come on now! droooooooooling over here! YUM! Our cooking club is doing Thai food this month and this looks like a must-try! Thanks for sharing! Behind the scenes would be fun. You make me tired just thinking about all you do. HA!! Loving these wraps! Looking forward to seeing the sneak-peaks!! Ohohohoho, it will definitely be a new favorite of mine! You have no idea how much I love lettuce wraps, and let alone Thai chicken with peanut sauce!! So a few things about this post! Heck yessss to all the behind the scenes photos of doing a cookbook! I’m super nosy too! These wraps look stunning and I love how you had to “remind” us to not skip the sauce. Ginger peanut sauce! I’d have that as a meal by itself!!!! Gorgeous! I am super excited for your cookbook! I can’t wait to see all the behind the scenes stuff that goes into makeing one, I find all the info facinating! I can’t even imagine how much work goes into even one page! I’m sure that your book will be simply drop dead gorgeous! These look great! I love lettuce wraps! I’d love to see your kitchen fails. You’ve mentioned before that your kitchen gets super messy when you cook. Can we have a photo??? Looks delicious and beautiful as always! 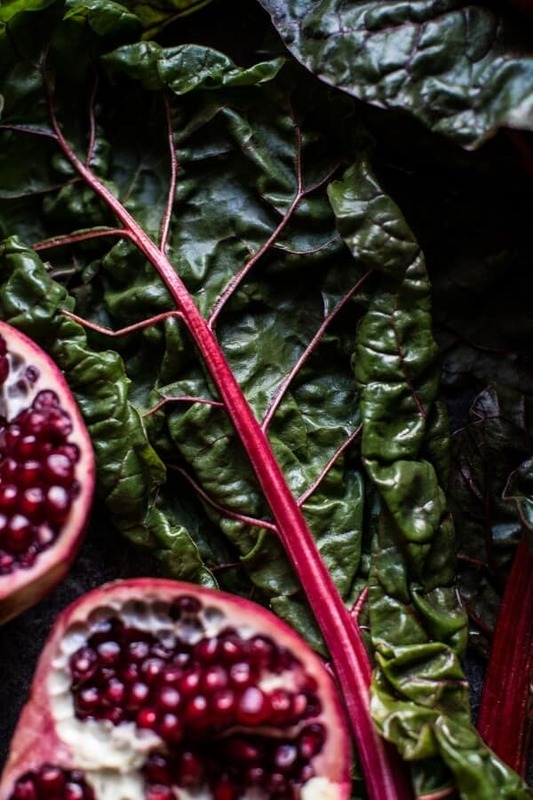 Love the pomegranate and swiss chard combo. Here’s to a happy and healthy new year! I love this <3 .. looks so good ! These look delicious! You are not alone in kitchen fails, never fear. 🙂 I’m a nosey person too and would love some behind the scenes posts! Gosh! I think your life is anything but boring! Being a nosy/curious person I welcome any behind the scenes stuff you’d like to share! Writing a cookbook must be intense. I am struggling to organize my piles of recipes into a useful format. So please share! 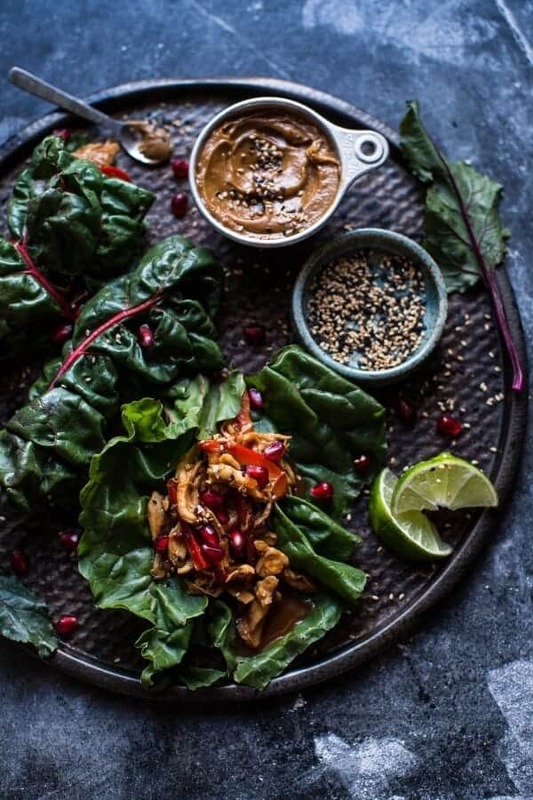 I love wraps that use big leafy greens instead of bready carbs….which I am cutting way back on …I’m talking to you bread and butter…. my downfall. Guess what just replaced my dinner plans, these AMAZING looking wraps!! I have been reading your blog for quite some time now and love it, but I will admit most of the recipes don’t fit my budget. I still love to read about the recipes, view the amazing photographs, and enjoy the fun way you write about your life with your crazy, wonderful family. Please take this as the kindest advice it is intended as – as a daily reader the one thing I will suggest to you is that we really don’t expect you to write your blog every single day. You are allowed to take time off and do other things. Do you have contracts that require you to blog every single day? If not, cut yourself some slack and don’t try to do everything all the time. We will be happy to read about your life, your recipes, and watch your videos 2-3 days per week while you work on your cookbook, your videos, the photographs, and side projects on other days AND still allow yourself to take weekends off to have play time. In regards to the cookbook, I would love to hear how you get and create the ideas for these recipes. How do you combine the ingredients you do and know they will work together? As for the failures, they are expected to be a part of any creative process and tie into how you create your unique recipes. You are very talented and driven but have set the bar really high for yourself and will burn out fast, especially starting at such a young age. I for one, do not want to see that happen. So for 2016 why not start by scheduling set days each week for different projects and cutting back the days you blog? We will still be here. I promise. Very wise advice! Stay busy but slow down and enjoy, life moves fast. Thank you so much for these kind words. I completely appreciate your advice and while I do not have contracts, I truly like writing and sharing on a daily basis. That said I am sure I will not be doing this forever and ever, but for right now I am very happy with the way I am running the blog. Thank you again and for reading daily!! Yes, yes, yes! Behind the scenes all the way! And any kitchen fail stories, because, um, I am one of those people who is always making kitchen mistakes and recipe fails, plus I am a creepy reader. ? Looks fabulous! Just wondering about the “sweet Thai Chile sauce.” Is there a recipe for the sauce or do you have a brand you like? 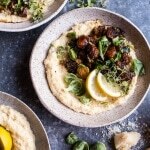 Love your recipes and photography! Thanks! Hi! I just buy mine in the Asian isle of my grocery store. I like Thai Kitchens brand. Let me know if you have other questions. Thanks! Kitchen fails keep us all humble for sure! Plus they are always great for a good laugh. 🙂 I love these wraps and that peanut ginger sauce. The perfect pairing! Cheers to your cookbook! Can’t wait to see it!! Thank you so much, Lauren! 🙂 Have a great friday! Thank you, Laura! Hope you had a great day! Hey Tieghan, salad looks amazing! Is the background you used just like tile or slate? Thanks! It is actually a sheet of soapstone. Thanks! Thanks so much! I see this often in other folks photography and always wonder what it is. Also, want to hook you up with someone who designs the magazine Sweet Paul. I showed her your stuff and she loved it! Care if I connect you two by email? That would be so nice of you! Please do! Thanks!! This recipe was AWESOME! Made it tonight with collard green leaves bc it’s what I had on hand. This is the first time I’ve made a “lettuce” wrap and I didn’t miss the tortilla at all. I made wild rice as a side. Can’t wait to finish the rest for lunch tomorrow! We enjoyed this recipe but felt the sauce for the chicken was too salty. I will make it again and cut back on the soy (I actually used aminos). We used swiss chard but could easily use whatever sturdy greens the CSA box has in it. Thank you for a new “lettuce wrap” recipe! Ah sorry it was to salty! Cutting back a bit should of course make that right! SO happy you liked them, thanks Jessie!